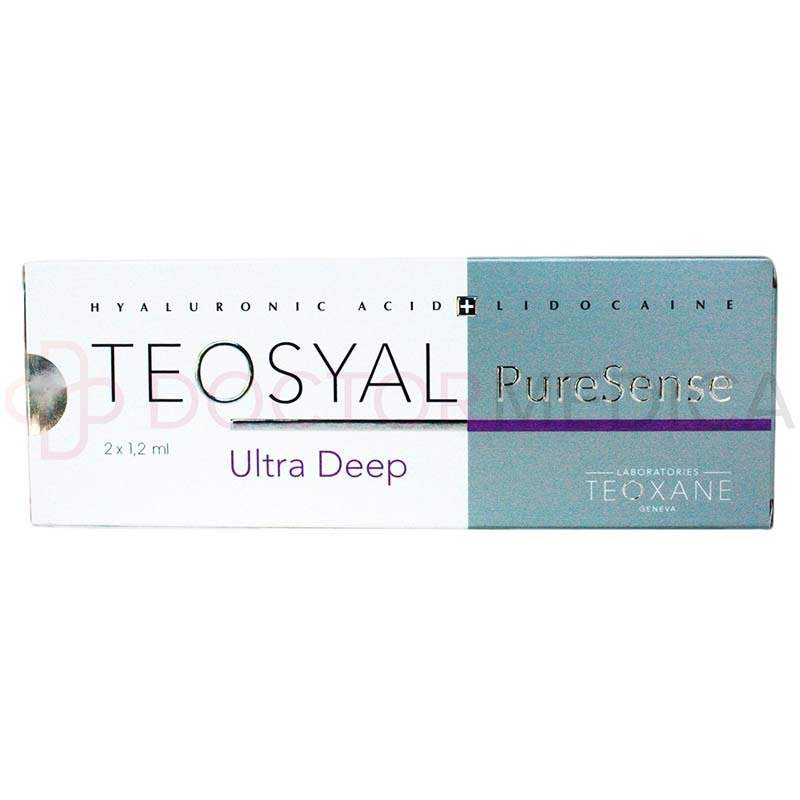 You can buy Teosyal PureSense Ultra Deep, an injectable gel that can help with restoring volume, filling depressions, and reconstructing facial structures due to lipoatrophy. You can get your supply at DoctorMedica.co by ordering online or calling in with, emailing, or faxing your order. Each pack of Teosyal PureSense Ultra Deep comes with 2-1.2ml prefilled syringes, 2 sterile 25G needles, 2 traceability labels, and the package insert. 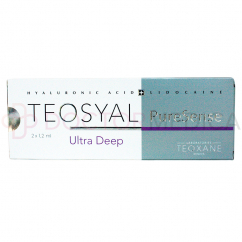 Teosyal PureSense Ultra Deep is proven to be effective and safe for correcting severe wrinkles. This filler is beneficial, even in patients with thick skin, in smoothing out severe folds and wrinkles. Its high volumizing capability and lidocaine content, makes it an excellent solution for various problems affecting mature skin. 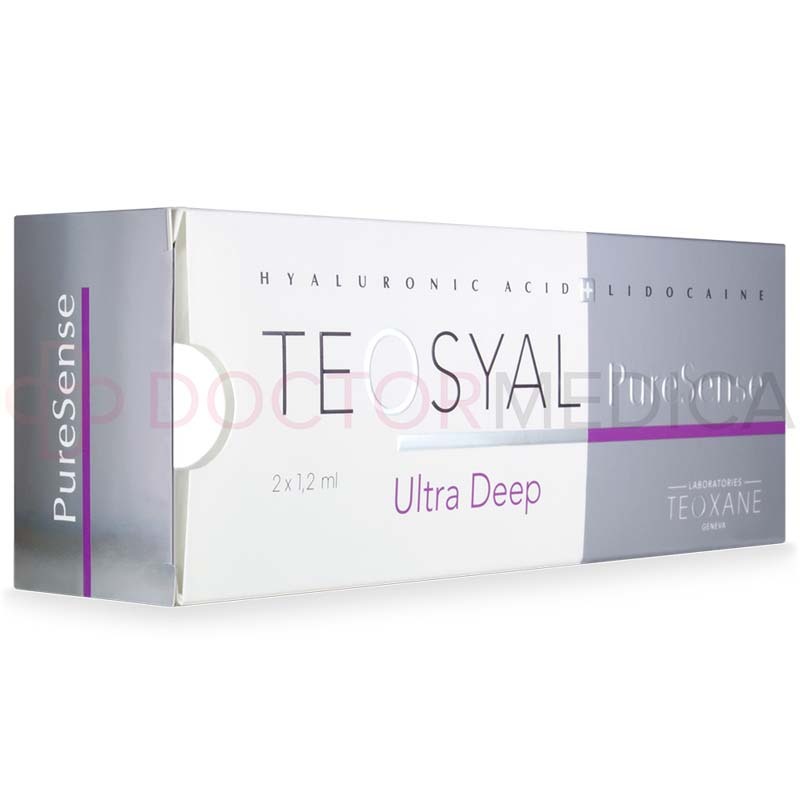 The active ingredients of Teosyal PureSense Ultra Deep is cross-linked hyaluronic acid at 25mg concentration. 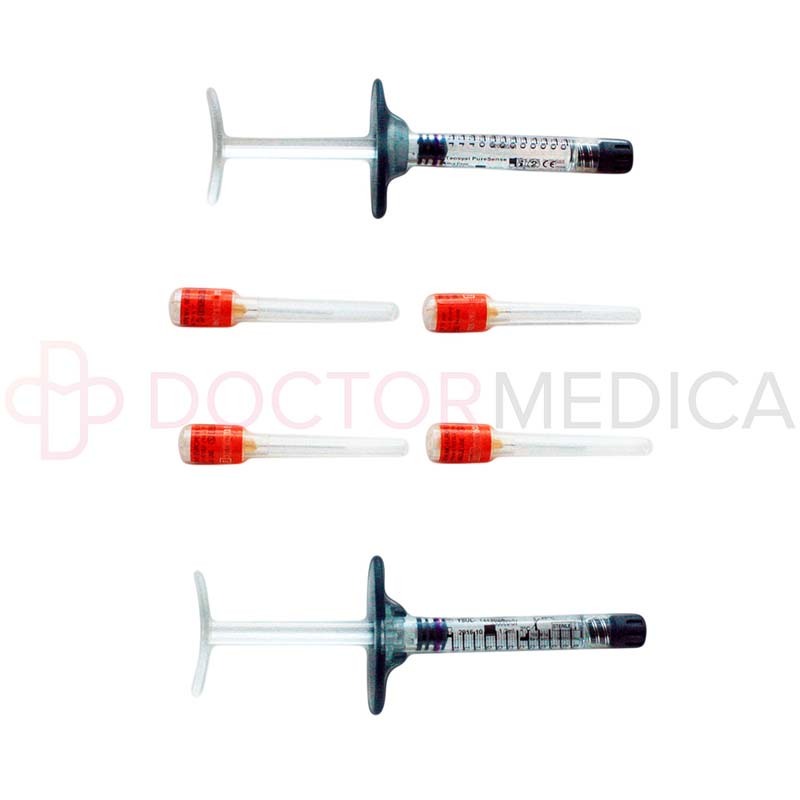 It also contains Lidocaine hydrochloride 3mg, and phosphate buffer pH 7.3 qsp 1ml. After injecting Teosyal PureSense Ultra Deep into the deep dermis, hyaluronic acid immediately works by binding to water molecules, which plumps and hydrates the treated area. By adding volume under the skin, wrinkles and lines are corrected. Advise your patients not to take NSAIDs, anticoagulants, as well as high doses of vitamin E a week prior to treatment. Strict aseptic techniques must be followed to reduce the risk of infection and other complications. Using the provided 25G needle, inject into the subcutaneous or preperiosteal layers of the skin. The injection technique depends on the area to be treated and the amount of gel to be administered. Do not use this product for superficial injection as irregular correction may occur. Gently massage the injected area to allow even distribution of the gel filler. Teosyal PureSense Ultra Deep injection takes less than an hour to perform. Your patients should avoid extreme temperature exposure for up to a week. The use of makeup is not recommended for at least 12 hours after the procedure. 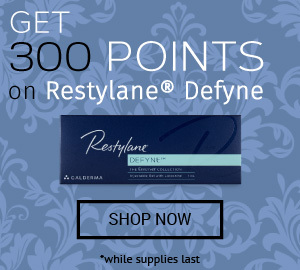 Use Teosyal PureSense Ultra Deep filler in correcting deep wrinkles and folds, sculpting facial contours, restoring volume loss, and enhancing the overall appearance of your patient’s face. This variant is extremely effective in remodeling facial features in patients suffering from lipoatrophy. If you want to provide dense volume in reshaping your patient’s face, with natural looking results, choose Teosyal PureSense Ultra Deep. Use to redefine facial contours, cheek augmentation, correct minor ptosis and lower eyelids, and fill in deep-set wrinkles. As with all variants from the Teosyal PureSense line, expect long-lasting results with this filler. Your patients will be able to experience a more youthful skin and well-defined facial structures for up to 18 months. The longevity of the effects can vary, depending on the individual. Patients with thick aging skin, severe wrinkles and other facial defects are very challenging to treat. That’s why Teoxane laboratories designed the Teosyal PureSense line. The brand aims to provide specific solutions that cater to different areas of the face, without compromising the patient’s safety and comfort. Teosyal PureSense Ultra Deep provides intense volume restoration, addressing the various concerns common in aging skin. 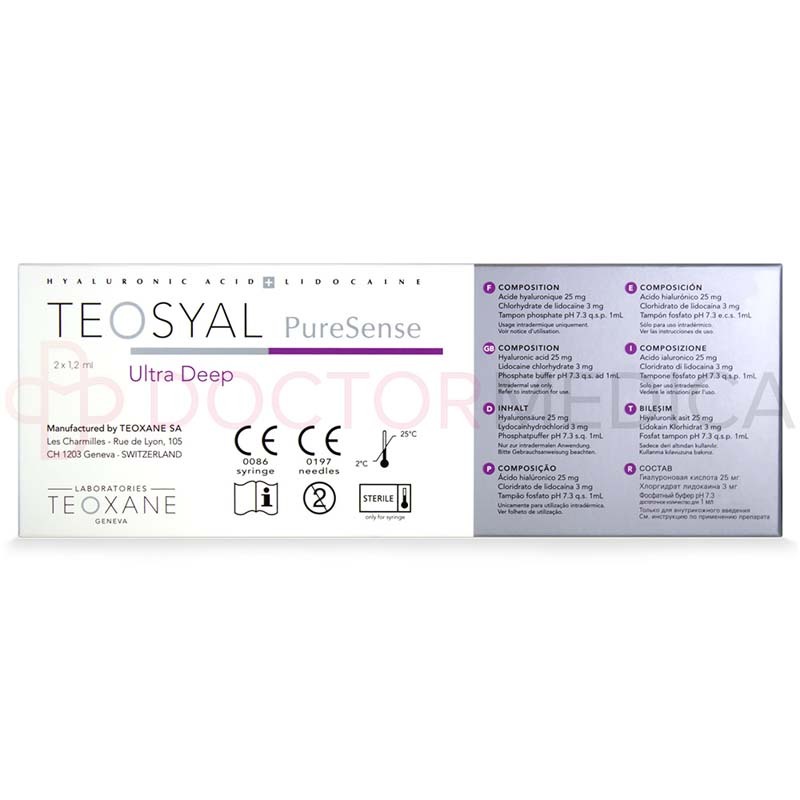 Teosyal PureSense Ultra Deep is a suitable filler for patients who require a more intensive solution to visible signs of aging. It works in the deep layers of the skin, restoring or creating volume to get well-defined facial structures in less pliable areas. Patients who are looking for temporary fillers with natural looking and long lasting results will be satisfied with this treatment. Although the products under the Teosyal PureSense line are well tolerated by more than 90% of patients, some post-injection reactions may still occur. These side effects are minimal and temporary, lasting about 2 days up to a week without medical intervention. Common side effects include redness, itching, dyschromia, swelling, and temporary loss of sensitivity at the site of injection. Please refer to the product leaflet for a full list of side effects, precautions, and contraindications.